Not a knife and fork but specialized haggis hunting tools! Oh, Peter, you shouldn't have encouraged me. Some followup pictures. The first appears to be Princess Louise's cypher and coronet from the 91st (Princess Louise's Argyllshire Highlanders). The second and third are the Boar and the Cat respectively. I wasn't able to attribute these in a quick search of J. S. Farmer, Kipling and King and Reginald Cox's books, but assume that one or both would have been the badge of the 93rd ( Sutherland Highlanders). "In 1871 the Queen’s daughter, HRH Princess Louise, married the Marquess of Lorne, (later 9th Duke of Argyll) and at the wedding the 91st provided the Guard of Honour. A year later in 1872 she was appointed Colonel-in-Chief and the 91st became ‘Princess Louise’s Argyllshire Highlanders’, with her coronet and cipher and the Argyll Boar’s Head and motto of ‘Ne Obliviscaris’ added to their insignia." of the 'cat-a-mountain'. 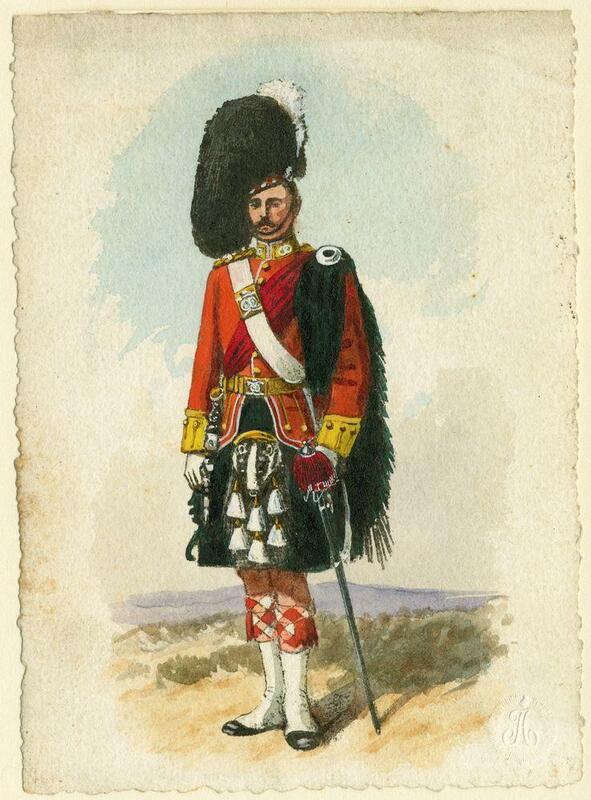 Beautiful Dirk to the Argylls. They are very expensive but well worth it, I would say. The pure quality of it is just fantastic, really a beautiful thing. Great find and thanks for sharing! In the drawing below you'll find an Officer of the Argyll and Sutherland Highlanders in the Victorian period wearing his Full Dress Uniform and has his dirk on his belt.